Magic is a game of change. The cards are constantly changing. The mechanics are constantly changing. The themes are constantly changing. The worlds are constantly changing. The overall structure of how sets are released is constantly changing. Through it all, one thing has stayed the same: the method by which we make the game—what we call design and development. That's been a constant from the day I joined Wizards R&D 22 years ago. Today, I explain how and why that system is finally changing as well. Before today's column is over, I'm going to review what the system had been, explain the issues the old system was creating under our new paradigm, and walk you through how the new process works. Note that because we work two years ahead, this system has been the status quo in R&D for a while. I bring it up now because Rivals of Ixalan is the first set you all will see under the new system (with the big caveat that it was a set caught in the middle of the transition of the change and doesn't quite work like the sets that follow. Dominaria is the first set to have the distinct teams I'm going to be spelling out below; Rivals of Ixalan crammed the whole system into a single team). I'm going to back up to before Metamorphosis 1.0 took place (the move from large/small/small/core to large/small/large/small), as the evolution of this process had a lot to do with the changes created by that shift. I'm going to be focusing on the mechanical side of R&D, as that's primarily what has changed. The creative team, made up of the story and art teams, is still very involved and interwoven into the whole system. Their part itself, while affected by the changes, didn't change all that much. Anywhere from five to seven years ahead of time, we'd roughly plan where we wanted to be going. All the different sections of R&D would chime in and we'd agree to a series of worlds to visit. Then, three and a half years ahead of release, we'd start the exploratory design team. This team would meet for a year. Usually they would meet twice a week for one hour. The first meeting was to brainstorm ideas, design cards, and put together decks. The second meeting was to play those decks with me for feedback. This team wasn't trying to put together a card file, but rather was just exploring different design spaces. Sometimes they came up with mechanics, sometimes they would lay the groundwork for where design would want to start. Two and a half years ahead of release, design would start. This team would meet for a year. Design's job was to figure out what exactly the set was about, choose mechanics and themes, and then create a full card file. One and a half years ahead of release, development would start. This team would meet for nine months and was responsible for taking design's file and shaping it into a tournament-viable product. This is where the cards were officially costed and Limited archetypes were perfected. Development was the second set of eyes that evaluated every aspect of the set and made sure that it was doing what it needed to do for all the various things we cared about, especially Standard, Booster Draft, and Sealed. If any part of the set needed to be overhauled, development would change it. That always involved changing cards, and sometimes it involved changing mechanics or themes. Although the exploratory design part was newer, that system went back to the very beginning of the game. Starting with Battle for Zendikar block, we moved from the large/small/small/core system to the large/small/large/small system. The change meant we were moving from a system of creating one world per year to a system of creating two. Under the old system, I usually ran the design for the large fall set, which allowed me the opportunity to help make sure the block was set up properly. I could figure out the general vision of the world and plan how the block would evolve. Was it chopped up into parts like Ravnica? Did it thematically evolve like Time Spiral? Was there some intricate relationship between how the sets were played like Khans of Tarkir? However the block was structured, I'd figure it out when I did the first large set. When we made this change, we started by revisiting two worlds. This made things a little easier, as returns start with much of the vision already baked in. Zendikar and Innistrad each had a definition, both mechanically and flavorfully. Yes, there would be new elements, but the design wasn't starting from a blank state. Following Innistrad, though, we had three new worlds: Kaladesh, Amonkhet, and Ixalan. Yes, Kaladesh had a little advance planning in Magic Origins, but not enough to mechanically define it (other than "something to do with artifacts"). To solve this problem, I came up with a novel idea. What if I co-lead each of the three sets with another designer? I would take the reins for the first six months and help define the vision and set up the mechanics, then hand off the reins for the second six months to let my co-designer continue to evolve it. That would allow me to work on both worlds each year. A side effect of this change was that exploratory design was shortened from a year to six months. Exploratory design had always been very leisurely, so I was confident we could condense the work down to six months without much loss to the process. 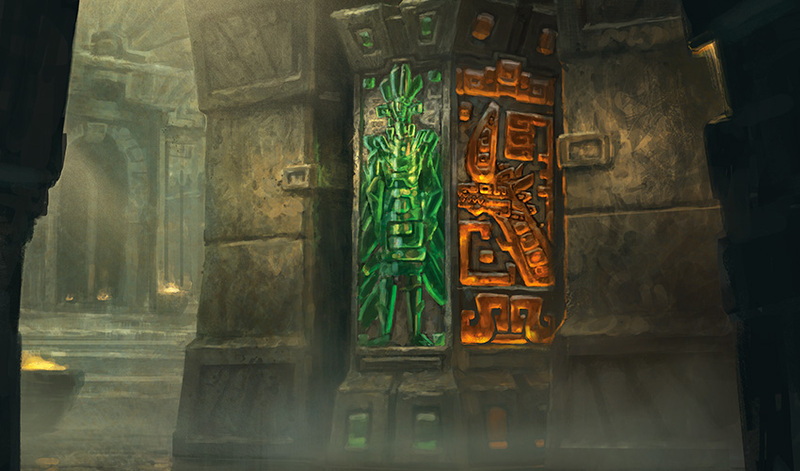 As the technology improved for crafting Constructed and Limited environments, it put more and more constraints on how cards and mechanics had to be shaped. Much of the beginning of development involved redoing a significant amount of the work that had been done during design. This was causing problems, because there was a small window once development started before cards had to be concepted to get their art in on time. This meant development was often rushed to do a lot of important work under an impossibly short deadline. A quick aside on art. Magic design happens before art gets assigned. Half of design even happens before the worldbuilding push. That means that art is seldom a limitation for design. If a card does thing A and they'd rather it do thing B, it can be changed. In development, this isn't always true. Once a card gets assigned art, aspects of the card begin to be locked down. Yes, it can still change, but only as much as it makes sense for the art that's been created for it. And remember that the art can often tie to mechanical executions (flying being the biggest one). The system allows a few late changes, but not a lot, so one of the many challenges of development is figuring out how to make changes within the confines of what the card creatively represents. At times, this can be extremely challenging. Many years earlier, we had tried to help this problem by starting a process called "devign" that happened during the last two months of design (for large sets). In devign, the lead developer would give notes to the lead designer to allow them a chance to try and fix the problems in a way that was consistent with the design. Over time, the developers started getting involved earlier in the design, with some even choosing to be part of the design team to let them help influence how things were being shaped. Another quick aside, this time about the design process. Design starts with great flexibility. Early on, almost any decision can be made and it's easy to switch directions, but as time elapses and decisions get baked into the design, it becomes harder and harder to undo those decisions. For example, we realized late into Khans of Tarkir's design that there was too much going on and clearly the piece that was the most separated from the rest was the morph mechanic. Everything else was tied to a specific faction. The problem was we had started with morph (before the factions were even a thing) and built around it, so by the time this discussion came up, the set was too centered around morph to be able to pull it out. The reason I bring this up is that development was realizing that there were decisions that they needed to weigh in on that were happening long before development started. Development also had a second problem. The beginning of development needed to be as early as possible, because there were a lot of changes that had to be instituted before art was commissioned. It also wanted to end as late as possible, though, because they wanted to have as much real-world data as they could to shape the environment. If a certain deck was a problem, for example, they wanted the ability to add cards to answer it. The goal was to do this without making development any longer, as there are multiple sets going on at once and you start creating resource issues if too many development teams overlap. The solution to this problem was to break development into two parts with a gap in the middle. Only the development lead would stay with the set during the hiatus, allowing the team members to work on other things. The first part would focus on cleaning up the set, and the second part would focus on how the set interacted in the various formats. This second part would be where development interacted with playtesting data from the set. One day, Erik Lauer asked if we could talk. He had a question he wanted me to think about. Were we handing off the sets at the wrong time? He said he liked the two-team system wherein one team comes up with the ideas and the other team executes on those ideas, but was our handoff point the correct time in the process for that to happen? I told him I wanted a few days to think about it. One technique I like when I'm trying to examine a problem is to take a step back and look at the issue from a broader vantage point. Get out of the weeds and look at the problem from higher up. To do this, I asked myself the question, how did design and development start in the first place? What forces were responsible for their creation? Why was that point chosen as the handoff? As it became clear that Magic was going to be a product in need of constant design, Richard came to work at Wizards. He brought with him a number of the playtesters and that group became the first Magic R&D. Before printing a set, R&D would form a team to look over the set turned in by an outside design team and be a second set of eyes. As the outside teams didn't always know the inner workings of the game, sometimes that second team would make significant changes to the file. Richard liked how this system helped refine sets by making sure that each component held its own weight and wasn't kept in solely for personal designer whims. The system was dubbed design and development, and became a staple of how Wizards R&D created not just Magic but all its games. The interesting thing looking back at the history was realizing that design and development had been created as a system between two teams that had very little interaction with one another. The reason a design team made a full file was that they were trying to create something that hopefully would get printed as-is. The goal of modern design was a bit different. We were working with development such that together we were making something that would be a great set. Design was never trying to make the finished product, but rather a file that would allow development to do their job and turn it into the best set. This made me realize that the dividing line that had been created was due to elements that no longer existed, so I went back to Erik and told him I was open to moving the handoff to a different point in the process. Did Erik have a sense of when would be the best time? He didn't have an exact time in mind, but he knew that he wanted the people responsible for the final card file to be involved earlier, so that they could help shape the set. It then dawned on me that I had essentially created a new deadline when I chopped my designs in half by co-leading with other designers. Kaladesh, Amonkhet, and Ixalan each had a six-month vision period where I was establishing the basic nature of the set and taking the first swing at the mechanics. The other advantage of six months was that it would allow us to do the vision for two worlds a year without having to overlap. Seeing that these two teams were fundamentally different from what we had been doing, we decided to give them new names. As both were design (note that our credits for years have called design "initial design" and development "final design," as what we all do is labeled "design" by the game industry), we decided to focus on what each team was doing. The first part would be called Vision Design and would be led by me. Vision Design is responsible for figuring out what the focus of the world is going to be mechanically. Ixalan, for example, started as a two-sided conflict based on a Meso-American–inspired world with Vampire conquistadors and ended its vision phase as a tribal set focusing on Pirates and Dinosaurs. Vision Design's job is to be a metaphorical architect, drawing the blueprints for the set to come. In order to fit exploratory design into this new system (as well as work with a new exploratory worldbuilding team), exploratory design was dropped to three months. The second part would be called Set Design and would be led by Erik Lauer. Set Design is responsible for making the set, metaphorically building the house based on Vision Design's blueprints. This team takes the design from concept all the way to finished product. They're the ones who field-test the ideas and mechanics the vision team created to see if they work together, fixing or replacing them if they do not. The Set Design team is then on the hook for designing all the cards (Vision Design creates cards as it iterates, which the Set Design team can use as they see fit). The first set to have distinct Vision Design and Set Design teams was Dominaria. Rivals of Ixalan had a combined team that did both Vision and Set Design. Just as we were adapting to this new system, R&D made the decision to shift from the large/small/large/small system to the three-to-one large/large/large/core system. This required a shift for Vision Design, as I wanted each world to have its own time. So, instead of six months for a large and small set, we now have four months for each large set. Vision Design will be consulted on the core set, but there shouldn't be a lot of vision setting that needs to be done. Exploratory design was able to stay at three months. It was around this time when we identified another problem. R&D wasn't spending enough time focused on the tournament environment and problem cards were getting through that we should have caught. To fix this problem, we realized we needed a third team, what we ended up calling Play Design. 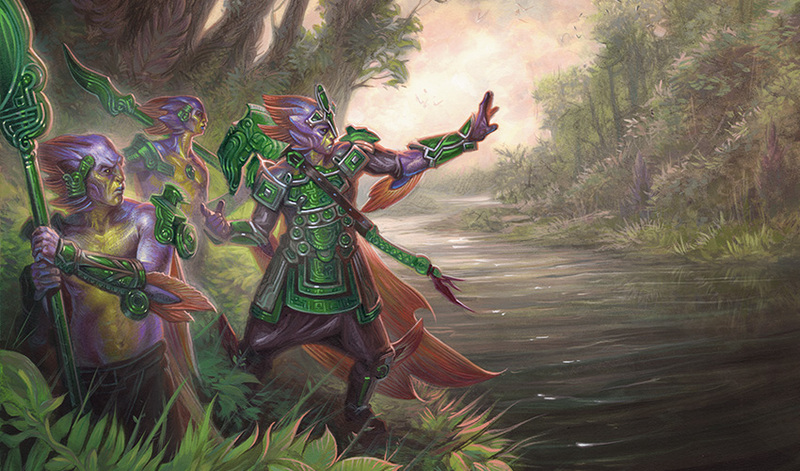 The idea behind the Play Design team was that it would be a group of R&D members whose main focus was the health of our core formats (Standard, Booster Draft, and Sealed) with an eye on a few other high-profile formats. Ian Duke was made the technical advisor of the Play Design team, and we hired Dan Burdick to be the manager. We then moved a number of R&D members onto the Play Design team and hired some new team members off the Pro Tour. The first set to have Play Design input is Dominaria, the first set to have a full Play Design focus (I'll explain the schedule below) is codenamed Milk, and the first set to have Play Design input in vision is Archery. With all that said, let's walk through how each team works. Vision Design – Each set starts with three months of exploratory design and then four months of vision design (vision is set up so each of the three large non-core sets has four months). Vision Design hands off a file complete with themes and mechanics, and a full set of commons and uncommons plus enough rares and mythic rares to be able to play Booster Draft or Sealed. Set Design – Set Design has two segments. First, there's a six-month segment where the file is compiled, and then after a three-month hiatus there's a three-month segment where the team works with Play Design to finalize the numbers on the cards. Play Design – Play Design has four three-month segments, one for each play environment (with four Standard-legal sets released each year there are four distinct play environments). Each one lines up with Set Design such that the first two months are the last two months of Set Design and the last month is the set after Set Design hands off (but when there's still time to tweak numbers if necessary). This means from the start of exploratory design to the end of play design is 20 months for a set. From this point forward, I'm going to start referring to the new teams by their current name, so from now on, for example, when a new set comes out, I'll be introducing the Vision Design team for the set in my column. I'm happy to finally share with all of you a change that happened for us years ago. I'm curious to hear your thoughts on this change. You can email me or contact me through any of my social media accounts (Twitter, Tumblr, Google+, and Instagram). Join me next week when I look at a skill that has helped me design Magic for 22 years. Until then, may everything I talked about today be invisible and just lead to better Magic.